The UK is home to a variety of migrant species for part of the year, including large flocks of wintering waterbirds, and songbirds that breed here but winter in Africa. Many of these species are declining in Britain and across Europe as a whole. As migratory bird populations may be affected by threats on their breeding grounds, wintering grounds and stop-over sites, they are particularly vulnerable to the effects of environmental change and understanding the causes of declines is extremely difficult. The rapid intensification of agricultural systems and habitat loss in Europe has driven declines of some species and global climate change is implicated in the declines of others. Our understanding of migrants is being revolutionised by tracking technology, which the BTO is taking advantage of to study a range of species, from small passerines to seabirds, that have historically been difficult to track once they leave their breeding colonies. We received funding for five satellite tags and fitted these to male Cuckoos in Norfolk in spring 2011. Follow the birds' movements on the Cuckoo tracking page. In 2009, 20 birds from the Fens were tagged in conjunction with the Swiss Ornithological Institute. Although prototypes, we successfully tracked one bird to its wintering area in West Africa. In summer 2010, Swifts breeding in three different areas were fitted with British Antarctic Survey geolocators weighing just 0.65 g. These devices were retrieved when the birds returned to their breeding colonies in July 2011, giving some fascinating results. In 2016, the BTO deployed 20 geolocators on Whinchats on Salisbury Plain - a lowland population. 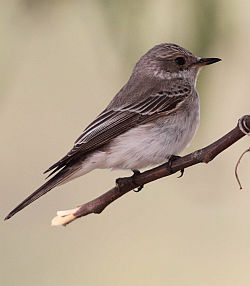 This project will locate the winter destinations of Whinchats in West Africa and identify migration routes. The RSPB have also tagged 19 birds at a complementary upland breeding site in Cumbria. In 2010 and 2011, we fitted state-of-the art GPS tags to 25 Lesser Black-backed Gulls breeding in Suffolk and 24 Great Skuas breeding in Shetland. These solar-powered tags were manufactured by scientists at the University of Amsterdam, and download remotely to give unprecendented detail on the position, speed and flight altitude of these species. This project, funded by the UK Department for Energy and Climate Change (DECC), is on-going, but we already have fantastic results on birds' movements and behaviour in the breeding season, over winter and on migration. In 2016, we fitted state-of-the art GPS tags to 5 juvenile Goshawks, in the Brecks. This was to monitor dispersal and habitat use. These solar-powered tags download location information remotely to give details of position and movement. Funding was provided by the ‘Breaking New Ground’ Landscape Partnership Scheme in the Brecks, supported by the Heritage Lottery Fund. For further information about the scheme, visit www.breakingnewground.org.uk’.